Todd Ficken, left, of Niwot-based F&D International, LLC, an architectural and engineering firm, presents to the Craig Rural Fire Protection District Board a $470,529 contract with WHP Trainingtowers for the purchase of a fire training tower kit. The board approved the contract, 4-0, and is seeking to finish the tower before the end of the year. 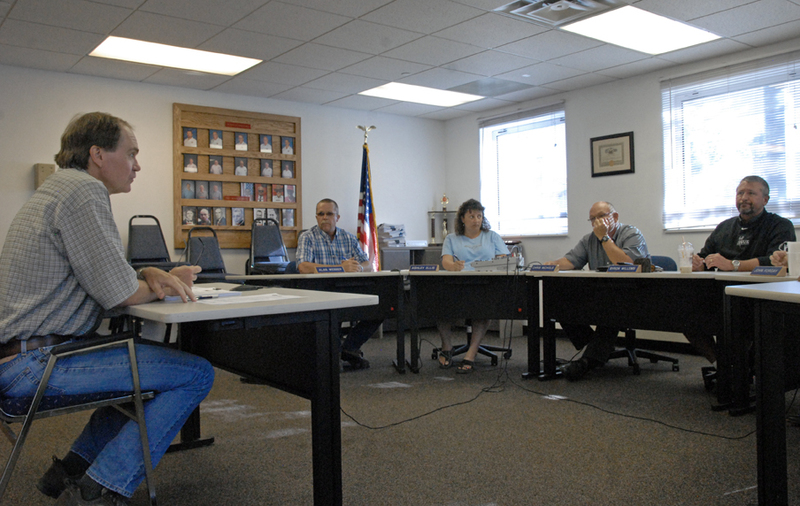 The Craig Rural Fire Protection District Board met Monday night for a special meeting to discuss a purchase contract for a live fire training tower kit. The board approved a similar $470,529 contract with WHP Trainingtowers during its May meeting. That contract was contingent upon approval of a land transfer agreement between Colorado Northwestern Community College and the fire district. But, when CNCC Board members balked at the agreement fire officials initiated alternate plans to build a training tower on land owned by the fire district on Industrial Avenue behind Kmart. The special meeting was called to “get this in the production queue” in hopes the tower could still be built before the end of the year, board secretary/treasurer Chris Nichols said. Todd Ficken, of Niwot-based F&D International, LLC, an architectural and engineering firm, presented the new $470,529 contract with WHP Trainingtowers, which the board approved 4-0. Fire officials should receive construction drawings from WHP within the next 40 days, at which point the board can begin the bid process for contractors to build the tower. Ficken said the 40-day timeline should also provide him enough time to resubmit variance requests and new site plans to the City of Craig. Craig resident Ken Wergin, who supports the training tower, recommended the board prepare for a second barrage of public criticism. Willems said fire officials expect to be better prepared this time around and plan to combat the smoke concerns by presenting visual examples of live fire training facilities constructed near parks, government buildings and fire houses throughout the state. He also said officials would specifically address public pressure to move the training tower out of town by citing the added cost for necessary infrastructure. “I think what people don’t understand is the cost to extend things like water and sewer and other things out of town is huge,” Willems said. “It would cost the taxpayers a lot more money to construct this tower out of town.